Natural Light Blue Topaz.45cts. Total # Of Stones: 1Cut: Heart (4.12mm). Natural White Round Diamonds.01cts. Color: Light Blue Clarity: Clean. Ring Size: 7.25. This lovely ring has 1/4 Carats in natural mined diamonds and a 1 Carat Blue Topaz. 3/8" down the finger. Coms gift boxed. Great pre owned condition. I am not sure of the exact size, color and clarity of the stone and diamonds, diamonds are natural but small. 7.5 gr Stamped 14k. the stone is 11.5x11.5mm. Great appearance. GENUINE 3.77 Cts YELLOW TOPAZ & DIAMONDS RING 10k WHITE GOLD. Gem Type:1 genuine Yellow Topaz - 3.77 carats. Yellow topaz Grades White sapphire grades. 2 Genuine Diamonds - 0.025 carats each. Weighs 2.05dwt. Stamped 14k. In good condition, see photos! We stand behind all our products to be as described. WE WILL NOT DECLARE A LOWER VALUE FOR ANY ITEM(S). Ladies Genuine Oval Checkerboard White Topaz Solitaire Gemstone Ring. The upper part of the double band contains two accenting white diamonds. The setting and slender band are mirror finish alluring 10 karat white gold. Center stone about 8 mm. Gemstone: Genuine Swiss Blue Topaz, Round Cut, 8 mm, Checkerboard Cutting, 2.25 Carats, Lagoon Blue Hue with Brilliant Sparkle. Ring: 2.00 grams 14 Karat White Gold with 14K Stamp. Ring is in standard size 7. Ring features exceptional Design, Craftsmanship and finishing. Perfect gift for Mothers Day, Birthdays, Valentines Day, Graduation, Christmas or just about any other occasion. Includes a Presentation Gift Box. Style R62208. This exquisite square checkerboard cut genuine light blue gemstone is a coveted color with a dazzling finish. Joining the topaz gemstone are 16 round blue topaz gemstones nestled in the slender white gold band. This beautiful toe ring is sparkled with eight round cut pink topaz gemstones carefully cradled in 14k solid white gold prong setting. 14k White Gold. Gemstone Toe Ring. Ring Style. It all started with a dream. Rare Coins, Currency & Bullion. Ladies yellow topaz and diamond bow tie ring in 10k white gold. The yellow topaz is round brilliant cut, 1.00 total carats. Loose Diamonds. The round diamonds are.25 total carats, J color, i1 clarity. Beautiful 10k White Gold Topaz Heart w/ Diamond Accents Ring, Size 5​.75. 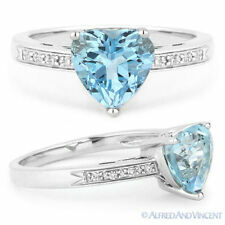 It is set with an Heart Shaped piece of Aquamarine stone and accented w/2 Round Diamonds. The face of the ring is 11 x 7 MM and it weighs 1.8 Grams. It is marked 10k and has been tested for Gold content. 10K WHITE GOLD, 6.5 GRAMS SIZE 5.5. Free Ring Resizing. Surrounded by genuine & natural pave diamonds totaling 0.40CT. Hallmarked 585 (14k). Gemstone: Genuine Swiss Blue Topaz, Princess Cut, 8 mm, 2.75 Carats, Lagoon Blue Hue with Brilliant Sparkle. Ring: 2.50 grams 14 Karat White Gold with 14K Stamp. Ring is in standard size 7. Ring features exceptional Design, Craftsmanship and finishing. Perfect gift for Mothers Day, Birthdays, Valentines Day, Graduation, Christmas or just about any other occasion. Includes a Presentation Gift Box. Style R62188. 9ct WhiteGold Filled. Pretty Topaz with 3 Little Diamonds Either Side. Brand New 14k White Gold DIAMOND - MYSTIC TOPAZ Ring-Free Shipping! Lady movable stone ring. Ring size # 6.5. Material : 14Kt solid White gold. Gold weight : 5.8grs. 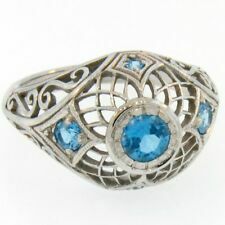 Signed HDS 10 K White Gold Cocktail Ring With Blue Topaz Stone Size 7.75. The ring is size 6.75. Features three natural blue topaz oval ,center flanked by two trillion topaz ,on each side. There are 8. Round brilliant natural diamonds are set all along the band,4 on each side. MAIN STONE MYSTIC TOPAZ. TOTAL CARAT WEIGHT NON DIAMOND - APPROX 1.25. TOTAL CARAT WEIGHT DIAMOND - APPROX 0.02. RING SIZE 7.5. make Supersized seem small. ELEGANT 10K WHITE GOLD APPROX. 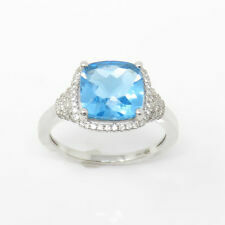 2/3 CTW BLUE TOPAZ & DIAMOND ACCENT RING! ELEGANT 10K WHITE GOLD APPROX. 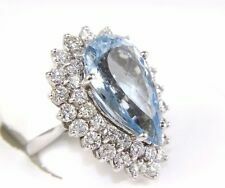 2/3 CTW BLUE TOPAZ & DIAMOND ACCENT RING! THERE ARE ALSO FOUR TOPAZ BAGUETTES AND TWO ACCENT DIAMONDS FOR A GRAND TOTAL OF ABOUT 2/3 CARAT! IT HAS CERTAINLY BEEN WORN, IS IN NICE CONDITION AND GOOD WORKING ORDER! Gemstone: 10mm x 10mm approx. (3ct approx.). Material: 14k White Gold. Stamped “14k Solstice”. Shape: Round. Band Width: 2.5mm approx. (from back view). Jewelry Type: Ring. MATERIAL: 10K White Gold (marked). STONES: Square Checkerboard cut Smokey Topaz, Diamonds (0.01 TCW). The p ictures are enlarged to show detail. All photos are of the actual piece being sold. SIZE: 6.75. Main Stone Shape Trillion. Main Stone Topaz. Ring Size 7. Ring Size - Selectable (Stranded Size US 7). Main Stone Color Blue. Cut Very Good. If the information does not match, your order may be canceled. Genuine London Blue Denim Topaz Ring Set In 14K White Gold!! 3 stones totaling 6.76 carats set in a pretty braided design made of 14K white gold. Marked inside band. Center Stone is 3.08 carats and 2 side stones are 3.68 cts each. Size 8. Center Stone Shape : Cushion. DIAMONDS SPECIFICATIONS. ALL OUR DIAMONDS ARE 100% NATURAL AND NOT CLARITY ENHANCED OR TREATED IN ANYWAY. Side Stone Shape : Round. Side Stone Clarity : SI1, very clean and shiny. Creatively made with 1 Topaz & 1 Diamond. Total Carat Weight ( Topaz) : 1.85 CTS. GORGEOUS 14K WHITE GOLD RING. Total Carat Weight ( Diamond) : 0.28 CTS. THIS STUNNING RING IS 10KT WHITE GOLD WITH A SMOKEY TOPAZ. IT IS A SIZE 7 3/8. THIS RING WEIGHS 1.2 GRAMS. The ring is constructed of white gold marked 10K. The carat weight for this ring is unknown. This piece would make a wonderful addition to anyone's jewelry collection! GOOD LUCK!! Here we have a 2 stone ring that represents a promise to the one you love. The stones are Mystic Topaz which has an array of colors that sparkle purple, green, pink and blue color. Above the heart shape stones there are two little gold hearts with 1 mm diamonds in the center of each. GENUINE 6.18 Carats AZOTIC TOPAZ & DIAMONDS 10k White Gold RING. Gem Type : 1 Genuine Azotic Topaz - 6.18 carats. Azotic topaz grades. 4 Genuine Diamonds - 0.015 carats each. Diamond grades. Carat:10k White Gold (not plated).